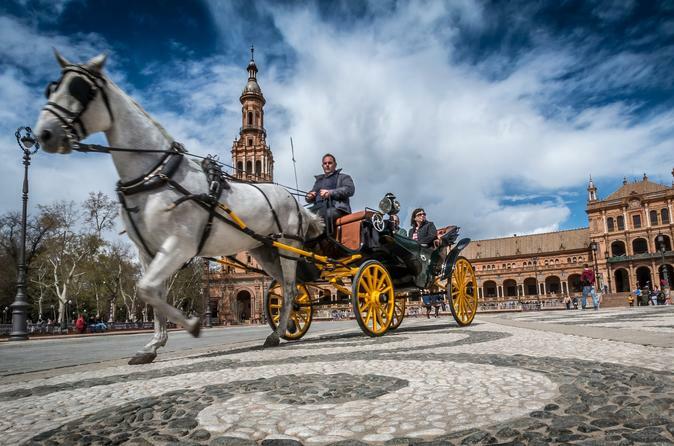 Ejoy a 7 multi day tour through Caceres, Sevilla Ronda, Marbella and many more from Madrid. 2nd. Day (Sunday) SEVILLA Half board in the hotel. Morning city tour visiting the typical Barrio de Santa Cruz with its narrow streets, the Park of María Luisa and Plaza de España, with a panoramic sightseeing of the city. Optional Artistic tour including the Royal Alcazar Palace. Afternoon at leisure. 5th. Day (Wednesday) MARBELLA-GRANADA (180 kms) Breakfast. Departure to Granada. Sightseeing tour including the impressive Alhambra with its beautiful Nazari Palaces and the Generalife gardens. Dinner and accommodations. Optional visit to the caves of Sacromonte and attend a typical show of gipsy flamenco. 7th. Day (Friday) VALENCIA-BARCELONA (355 kms) Breakfast. Free time. At mid morning departure to Barcelona. Arrival and end of our services.